This Reconsructionist congregation combines traditional Jewish worship with contemporary American thought. They have a particular reverence for nature and look for modern interpretations of historic Jewish architecture and imagery. The site design will lead you through a series of vine-covered gates and arbors toward the sacred ark. The entry forecourt is a rectangle defined by cedars. Trees on the site and in the gravel parking area have been preserved and added to create a wooded atmosphere. 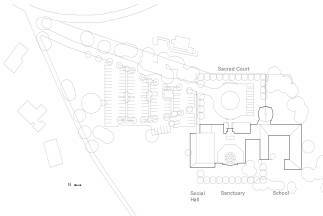 The building has three main parts—sanctuary, social hall, and school, each with its own outdoor space. The building recalls 18th century wooden synagogues of Eastern Europe. Floor patterns throughout orient congregants toward Jerusalem. Materials are “eco-kosher,” recycled or sustainable in most cases. Natural light and ventilation are used throughout. There are views and access to nature from every space. The lobby connects the parts of the building. It is a gathering place as well as a place to prepare for prayer. Tallit, (shawls), kippot, (scull caps) and prayer books are displayed in cedar casework celebrating the preparation for worship. The sanctuary is a fabric-tented space, as was the ancient sanctuary. Its cupola recalls old wooden synagogues. Windows connect congregants to the seasons while worshipping. Changing light and seasonal views, link the cyclical reading of the Torah to nature’s cycles. 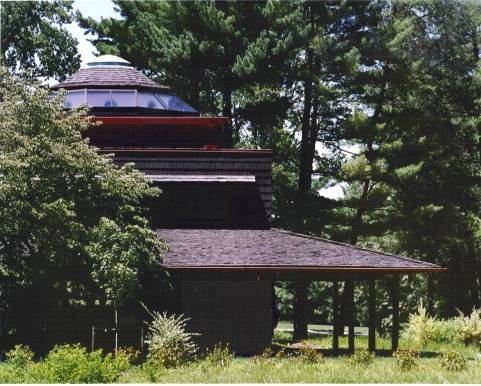 The social hall is a multipurpose passive solar space with many operable windows and a porch for eating outside. The school has a single loaded corridor that surrounds a play space courtyard.